by David R. Boyd. Vancouver: UBC Press, 2012. 468pp. Hardcopy $105.00. ISBN 978-0-7748-2160-5. Paper $37.95. ISBN 978-0-7748-2161-2. Reviewed by Michele Morrone, Department of Social and Public Health, Ohio University. Email: Morrone [at] ohio.edu. Should humans have a constitutional right to a clean environment? This is the philosophical question that is the basis for the research in this book. The author’s position on this question is specified before the text even begins as he dedicates the book to all of those who have fought for this “vital human right” and this is the context in which the book must be read. Nevertheless, the main purpose of this work is to provide data and examples related to how the right to a healthy environment has become integrated into legal frameworks in most of the countries which are members of the United Nations. There are three main sections in the book starting with a theoretical and framing discussion about the use of constitutions and other legal mechanisms to guarantee this right. The second section of the book provides specific examples of nations that promote environmental rights through legislation and litigation. The book closes with a mostly optimistic account of how ensuring environmental rights is emerging globally and possibly resulting in measurable improvements in environmental quality. The first section opens with an introductory chapter in which Boyd establishes an argument for the timeliness of examining constitutional provisions relating to the right to a clean environment. There are three “broad developments” that indicate the time is right for discussing these rights including the emergence of constitutional democracies in new regions; imminent global environmental crises; and a “rights revolution” that emerged in the latter half of the 20th century prompting debate and discussion about the relationship between government and morality. As I read the opening chapter I immediately began crafting all sorts of arguments against a constitutional approach to environmental protection. My first thought was that current environmental laws must adhere to constitutions, making specific provisions redundant. Then I started thinking about the enforceability of such rights and that courts would become too involved in environmental decisionmaking. Reading on, I found that most of the arguments that I created while reading chapter one were presented and contested in chapter two. This chapter demonstrates Boyd’s thoughtfulness and skill in presenting his research related to environmental provisions in national constitutions. He lays a strong foundation for true discourse about the feasibility of enacting such constitutional provisions. The extent of the research on which the book is based becomes evident in Chapter 3 which provides an overview to [*24] the status of constitutional provisions related to environmental protection. Boyd explains that of the 193 countries that are members of the United Nations, 147 of them have provisions related to a clean environment. This chapter summarizes and categorizes the way in which these provisions are incorporated into constitutions and offers an analysis of their enforceability. He explains that the provisions are either responsibility-based or rights-based. That is, some of the provisions in the countries under study include the responsibility of government and individuals, while others focus on both procedural and individual rights to a clean environment. An interesting point related to cultural imperialism emerges in the data that is presented in this chapter and becomes more obvious as Boyd delves deeper into specific countries. When environmental rights are broken down by region, it is notable that North America and Oceania are the only regions that do not recognize this right. In his discussion of the role of international law, numerous international sources are presented that specifically focus on human rights. While most of these are identified as “soft law” such as nonbinding treaties and declarations, it is possible to link the human rights protections to a clean and safe environment. Furthermore, Chapter 4 provides examples of the emergence of international law in the form of regional treaties, court cases, and resolutions, among others, that make the leap from environmental protection as one of many human rights, to those that specify a healthy environmental as a specific right. Even though many of the international influences are not legally enforceable, when nations accept the international directives, constitutional change often follows. This chapter identifies the growing international support for the right to a healthy environment; however, Boyd notes that the United States is the “only nation that expressly denies the existence of a right to a healthy environment in both domestic and international law” (p.91). The meat of the work comes in Part Two of the book which is a more in-depth analysis of constitutional rights in specific countries in five regions: Latin America and the Caribbean, Africa, Asia, Eastern Europe, and Western Europe. The analysis in this section is explained in an introductory chapter and an Appendix and presents a fundamental issue in using a constitution to guarantee the right to a healthy environment; that is, identifying evidence that constitutional provisions actually lead to environmental improvements. Boyd identifies several conditions that are more likely to lead to positive environmental outcomes including the constitutional wording, whether the public is aware of their environmental rights, and if there are activist judges and attorneys who are willing and able to argue in favor of these rights. To focus on environmental outcomes, the framework for examining the positive and negative aspects of environmental rights in the five regions includes a legislative and a judicial aspect. In Chapters 6-10, each of the five regions is summarized with respect to their legislative and judicial approach to environmental rights. For example, in the Asia region, the Philippines is identified as a leader in creating environmental laws related to constitutional provisions that have [*25] actually improved the environment. On the other hand, several countries in Latin America and the Caribbean are very active in using courts to uphold environmental rights. Overall, this section of the book highlights the activity in Latin America and the Caribbean as being many steps ahead of other countries when it comes to implementing environmental rights through laws and court cases and resulting in positive environmental outcomes. The final section of the book reiterates many of the arguments made in the introductory section related to the impact of constitutional provisions on protecting the right to a healthy environment. The difference in this section is that the discussion is grounded in the analysis of the countries and regions presented in the preceding section. In Chapter 11, Boyd summarizes the advantages and “theoretical” disadvantages of using a constitution in environmental protection. While some of the discussion in this chapter may appear redundant, a closer read shows how the evidence presented in Chapters 6-10 is used to strengthen the arguments in favor of a healthy environment as a basic human right. Among the advantages presented are that, when the a constitution includes a specific provision for environmental rights, there is more public involvement, laws are more enforceable, and litigation is strengthened in favor of environmental protection. Even though the arguments against the use of a constitution are also discussed in this chapter, Boyd is explicit in his support of this approach, basing his support on the analysis all of the 147 countries in Part Two. Even with all of the analysis presented in this book, one big question remains: what impact do constitutional provisions have on improving environmental quality? This question is the focus of Chapter 12 in which Boyd compares environmental conditions in countries with and without constitutional protections. In conducting this comparison, Boyd uses quantitative metrics such as a nation’s ecological footprint and two ranking indexes based on international data. In addition, whether a nation has ratified international agreements and trends analysis in air pollution emissions serve as comparative tools. While this chapter makes a compelling case that there may be a relationship between constitutionally-protected environmental rights and environmental quality, there are some major limitations in drawing conclusions related to cause and effect. Boyd is clear about the limitations and calls for additional research to contribute to the discussion. 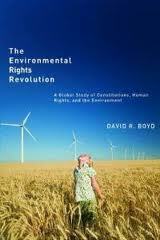 In the final chapter of the book, Boyd presents an optimistic view of the impact of constitutional environmental rights. While there are still some important countries that do not have specific environmental rights, the percentage of countries with these rights continues to grow. He reminds us that there are still major global environmental challenges that are difficult to address through the use of constitutions, however constitutions are the most obvious legal tool that both identifies a state’s priorities and specifies its commitment to human rights. Overall, this book is well-researched, expertly organized, and could serve as an excellent reference for legal scholars [*25] in the realm of constitutional and environmental law. The main criticism with the book is that it becomes a little confusing and difficult to read mainly due to the amount of information that serves as the foundation for the work. There are extensive footnotes and references and the research methods used in the book are explained in detail. Lest a reader overlook it, there is a comprehensive appendix (Appendix 2) of the 147 constitutions that the author examined in the book available on-line at: https://circle.ubc.ca/handle/2429/36469. This on-line Appendix is more than 300 pages and includes weblinks for additional information providing an excellent supplement for readers who are interested specific countries.